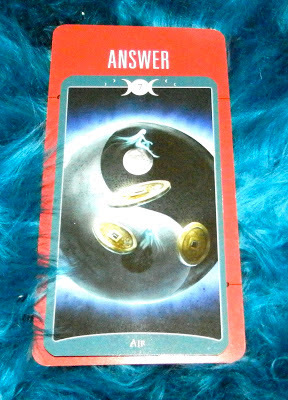 Today's Draw: The Seven of Air from the Book of Shadows As Above in the Answer position from the Deck of 1000 Spreads. Is there a question turning around in your mind? What do you suspect the answer to that question is? Is is possible the answer lies within the question itself? So I pull a card in the answer position, right? And I'm thinking (as I do every night), "Interesting. Now how the heck am I going to work with this card combo?" So I go into the book for inspiration (and also because this deck doesn't align with traditional card meanings) and the book meaning for the Seven of Air is "your answer lies within your question." I don't make this shizz up. But what does that MEAN...the answer lies within your question? Well, if you look at the card, you'll see a yin/yang symbol. Yin is the feminine and yang is the masculine and within each side, you'll see the seed of the opposite side. Within every opposing force is the seed of its opposite. Every love contains a seed of hate. Every truth holds the essence of a lie. And within every question, you can find the beginnings of an answer. Sometimes this is obvious, right? Someone will say, "Do I want get all dressed up and go to a sweaty crowded bar, or do I just want to sit comfortably at home in my jammies with a glass of wine?" We all know what the person wants to do by the way they asked the question. Or maybe someone says, "I wonder if moving would give a new perspective on life?" Well, why ask the question at all if you don't think it will? Or maybe you say, "Do I want French or Italian for dinner tonight?" Well, either would probably work. Otherwise you wouldn't be asking the question. Those are all easy ones. Life has much harder questions to ask. And sometimes people go to tarot readers to ask them. We can give you an answer, but that doesn't mean it's fated to happen. If you don't like the prospect of your future, change your present. There's a seed of the future in every present, too. But the interesting thing is that people often ask us questions they pretty much already know the answers to. I recently overheard a conversation between someone I read and a friend of theirs. The friend asked how it went and my client said, "she pretty much just confirmed what I was already thinking." But you wouldn't have known she had any clue as to the answer when she asked the question. She seemed to be genuinely unsure of which option she was going to choose. Sometimes it takes someone to tell us the answer to realize we'd known it all along. So think about the question that's turning around in your head today. Do you kinda think you know the answer, but suspect it's too colored by hope or fear to be relevant? Well, first, if you suspect it's too colored by anything, it probably is. Now try to step outside of that and look at the question again. Do you think you know the answer? Just like with anything, you could screw it all up—or save yourself from it—tomorrow if you just change what you're doing. But assuming things stay pretty much the same from here on in, chances are your suspicions about what will happen, will. What do YOU think it means to say "within every question lies an answer", and do you think it rings true?